Don’t Panic – Violation Notices are passed out during routine inspections of the neighborhood, when ARC committee members notice a violation, when the board receives a complaint, etc. Getting a notice of a violation DOES NOT AUTOMATICALLY EQUAL A FINE. Determine the violation – Read the violation form and refer to your CCRs for info. Don’t have a copy of the CCRs? 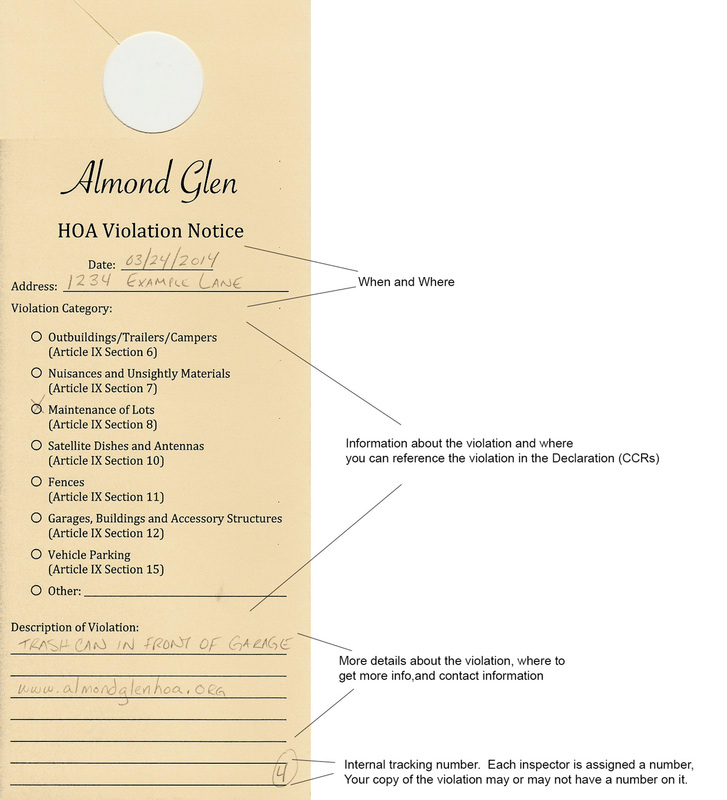 They are available for download (http://www.almondglenhoa.org/ccrs/). Still not sure what the violation is? Email the board of directors (almondglenhoa@gmail.com) or call our management company and ask for Danielle. PLEASE KEEP IN MIND THAT DANIELLE DID NOT ISSUE THE VIOLATION AND MAY NOT HAVE A COPY YET. BE PATIENT AND EXPLAIN WHAT THE FORM SAYS AND SHE WILL BE ABLE TO GET YOU AN ANSWER. Correct the violation – Yes, We expect you to correct whatever the violation is. When? Now. In most cases the violation didn’t occur overnight, but the rule has been there since you purchased your home or began renting. Chances are you have been in violation for sometime now, and should have fixed the issue a while back. If your grass needs mowed, please mow it. Trash can in front of the garage, move it or get an ARC request for a trash blind approved. House covered in mold, two words… pressure washer. We all agreed to follow the rules of the neighborhood when we moved in… so let’s work together. HOWEVER… if you need time to correct the problem, let us know. None of the board of directors is clairvoyant. We don’t know your lawn mower broke last week… so tell us what you need. Chances are there is someone in the neighborhood who will readily help you out. Communication is the key. Don’t think you are in violation? Need more information on how to correct the violation? Contact the board of directors (almondglenhoa@gmail.com) or call Danielle at AMG (Almond Glen’s Management Company). There is a process for appeals. Your “violation” isn’t a “violation”… you just forgot to get approval for a fence or other item. First off, lets be clear. Putting in a great fence that meets all of the CCRs without getting approval from the HOA (your neighbors all around you) IS a violation of the contract you signed when purchasing your home. If by chance your $3000 fence is not approved, you may find yourself in a real pickle. The good news… most “retroactive” ARC requests are approved without issue. We understand that many people make mistakes when dealing with an HOA. (We also know other HOAs give all HOAs a bad name and you may have thought it would be better to just skip the HOA approval process). Please just submit an ARC request ASAP and we will see what we can do. I rent, why are you bothering me with this? We leave the violation notices at the residence. You are living there, so it’s your responsibility to either correct the violation or notify your landlord of the violation per the terms of your rental or lease agreement. Never fear though. If the violation goes uncorrected and a 2nd notice is issued, a letter will be sent to the address on file with the HOA. If you are a landlord and you do not have a secondary address on file with the HOA, we certainly hope your renter doesn’t toss your violation notice letter in the trash. Do I have to pay a fine? Nobody who volunteers to work on the board of directors or the Architectural Review Committee wants to issue a fine to a neighbor. If you fail to respond to violation notices, letters, phone calls, emails, knocks at the door… then a fine may be levied. Please correct the problem or communicate with the board of directors so that we can avoid a fine. What if I just ignore the notices and refuse to pay the fine? I pay my dues, so what can you do about it? Like all things in life, it depends. You could have a lien placed on your home, privileges to use the pool or attend community functions suspend, and your right to vote or serve on committees or as a member of the board of directors suspended. In the most extreme cases, your home could be foreclosed on to cover legal fees, fines, expenses, etc. It’s kind of a big deal.